I mentioned in a previous post that DOOM was the title that got me started on configuring the best games of yester-year to work with my 360 controller. As a result, I have configured many more titles, from Star Wars flight sims to ridiculously clunky shooters like Fade To Black, with great success. I intend to share all of my most recent triumphs in control scheme mapping, but until I have researched a few more details (and done lots more testing) none of those posts are going to see the light of the proverbial digital dawn. So I figured why not just do a “quick” post on the game that started it all! Mapping DOOM’s controls to work with my 360 controller was a fairly simple affair, which was welcome, but was also a good learning curve as there were some basic issues which had to be overcome. The most glaring of these problems was the inability to remap the weapon hotkeys and, of course, there was no such thing as a mouse wheel back then so no “scroll up for next weapon” options either. The second was an apparent clash when trying to use the directional keys with mouse aiming, which would sometimes cause undesirable results in-game. 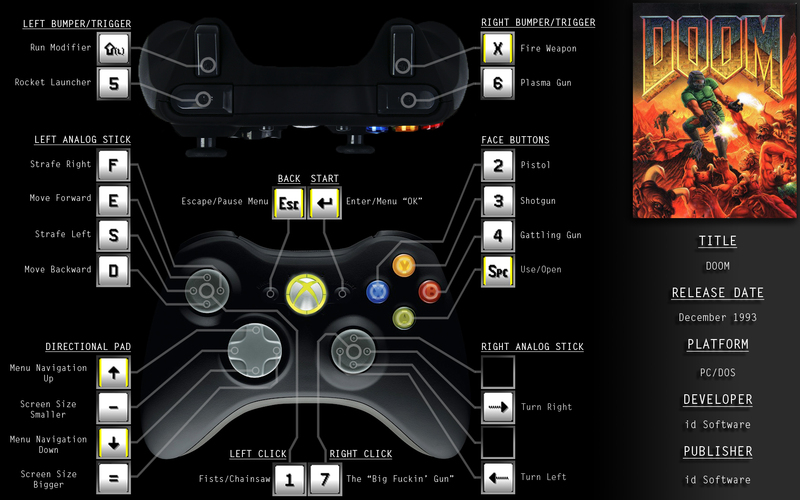 The solution to the first problem was simply to map each weapon to its own button corresponding to each number key. Thankfully, the rest of the controls for this game are so simple that available mappings were plentiful and the only challenge left was to try to get a workable configuration around the controls which HAD to be set in stone (ie fire, run & menu navigation). The second problem was solved by using the “EDSF” keys instead of the cursor keys and tweaking the mouse options in Xpadder for the right stick. This created an issue with menu navigation (as neither E nor D work for menus) which was then relegated to the Dpad Up/Down and used in conjunction with the existing Back/Start mappings of “Esc” and “Enter” respectively. Other issues proved to be pretty generic in nature and are usually evident in all new profiles I set up, but a little tweaking of dead zones and directional allocation on the analogs took care of the ever-present “drift” experienced by myself and oh-so-many other 360 gamepad users. Lastly, the “cherry” on my chocolatey, demon filled DOOM-cake! Are you ready to RUMMMMMMBLE!! Xpadder has the freaking awesome ability to include a generic rumble function along with any mappings you make. It has now become standard practice for me to utilise this for the right trigger (almost always fire or attack) and I also find it amusing to add it to buttons assigned to menu navigation, as it makes your choices feel somehow more tangible. Now, if you haven’t already, please go and check out Xpadder at http://xpadder.com and if you plan on using it, support Jonathan (the creator of this marvelous little app) by purchasing a copy. If, like me, you have already incorporated Xpadder into your emulation systems, then you’re in luck! I have decided to make available for download all of the configuration files I have created using D-Fend/DOSBox and Xpadder so that you can just slap them into their respective slots if you wish to achieve the same results I have. As an added bonus, I thought I would also let you guys grab a copy of the desktop image I use for reference when it has been a while since I have played a particular game (at least, that’s the idea). The JPEG is available for viewing directly via the thumbnail below, but is also included in the RAR file I have uploaded. which also contains the rest of the configuration files you will need to configure your Xpadder and DOSBox installations. So… here it is folks! Many hours of toiling and labouring, but in the end, I feel the result is well worth it. Lastly… here is the link to the above mentioned goodies!